Should you take a tour? 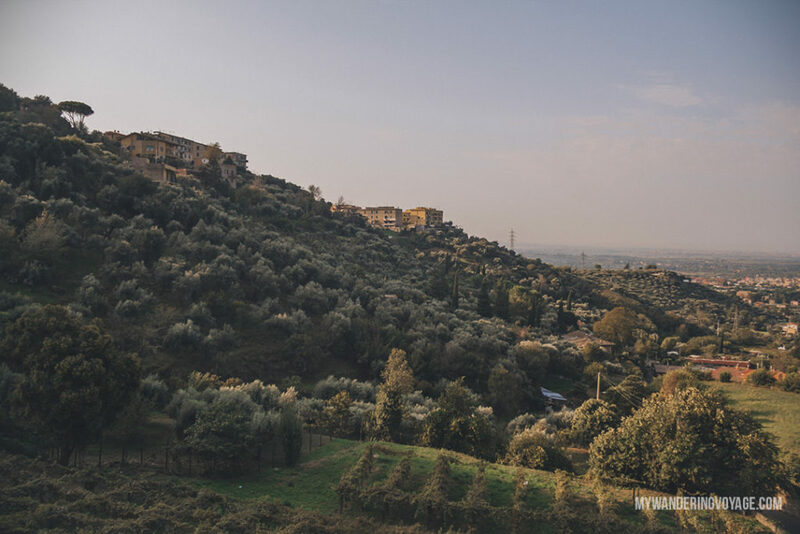 Tivoli is a mountainside town about 30 kilometres northeast of Rome, where historians have traced settlement in the area back to the 13th century BC. As it is with Roman history, the exact nature of how and why this area was settled is shrouded in myth. But shortly after the town became under Roman rule, it became a resort destination famed for its beauty and good water. 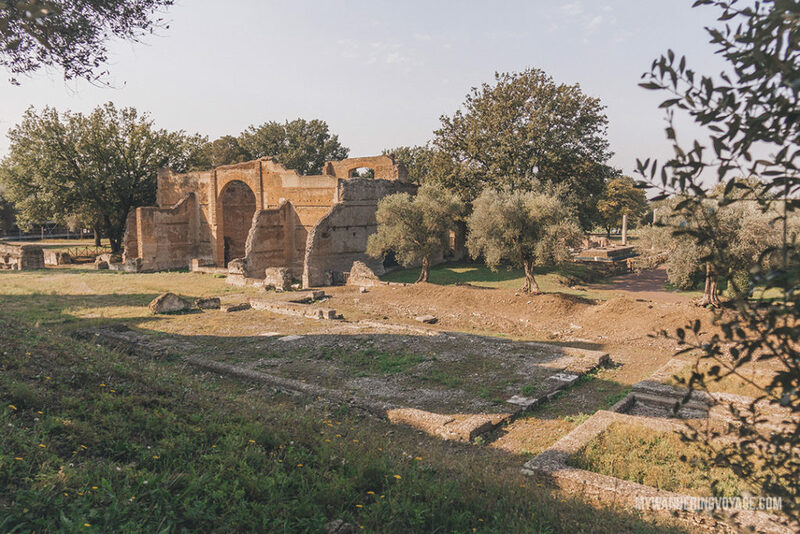 Romans built villas here; the most famous was Villa Adriana of the Roman Emperor Hadrian. In the new millennia, the town fell under papal control and later in the 16th century AD, Villa d’Este was built for Cardinal Ippolito II d’Este. 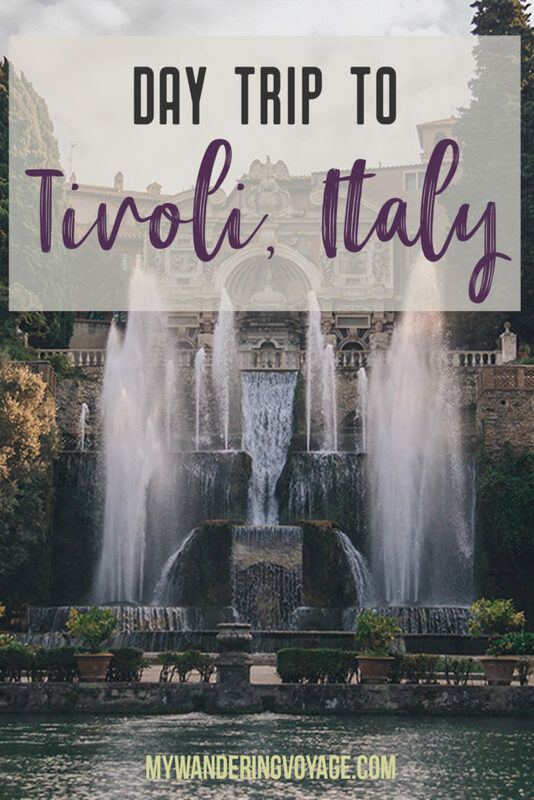 Tivoli was a prosperous town beyond the fact that it is a stunning area and grew to fame due to its life as a vacation home for Rome’s wealthy and important people. 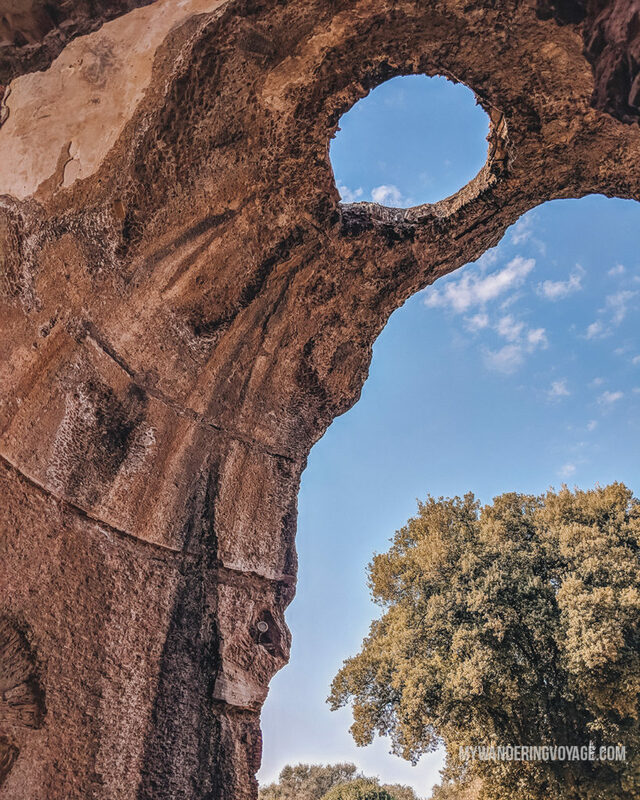 Tivoli’s quarries produce travertine, which was used to build the majority of Rome’s monuments and important buildings. 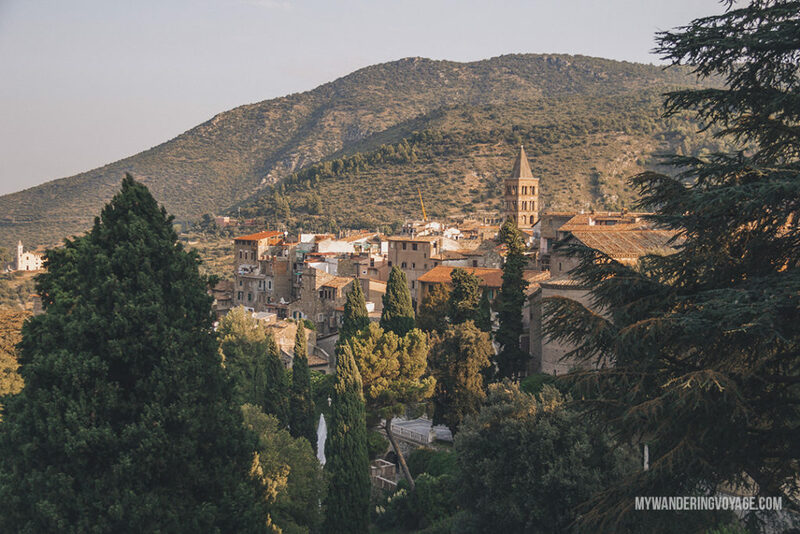 Tivoli sits atop a hill, giving incredible views of the surrounding area and its hillsides are covered with olive groves and farmland. What it is most famous for are its gardens in the Villa d’Este. The fame inspired the naming of other sites such as the Jardin de Tivoli in Paris, France; Tivoli Gardens in Copenhagen, Denmark; Tivoli City Park in Slovenia; Tivoli Theatre in Aberdeen, Scotland; Tivoli Theatre in Washington, D.C. and numerous towns around the world. 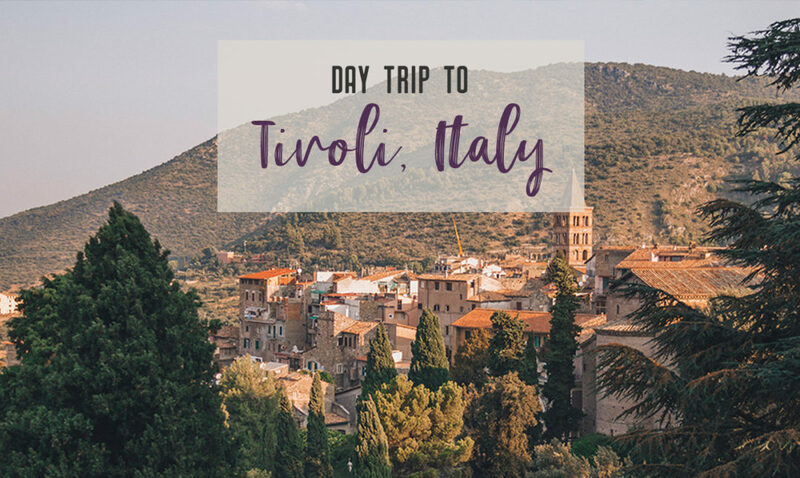 Today, Tivoli offers fantastic views of the town, access to some of history’s most incredible places and a wonderful place to feel like you’ve escaped the hustle and bustle of Rome. 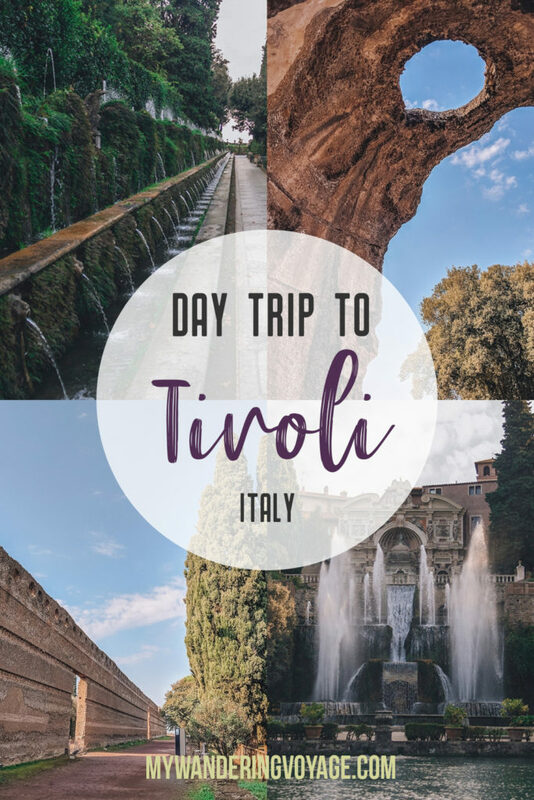 A day trip to Tivoli, Italy is a perfect way to spend some time outside the city centre, in the hills surrounding Rome. Villa Adriana, or Hadrian’s Villa in English, is a vast archaeological complex and UNESCO world heritage site dating back to 2nd century AD. 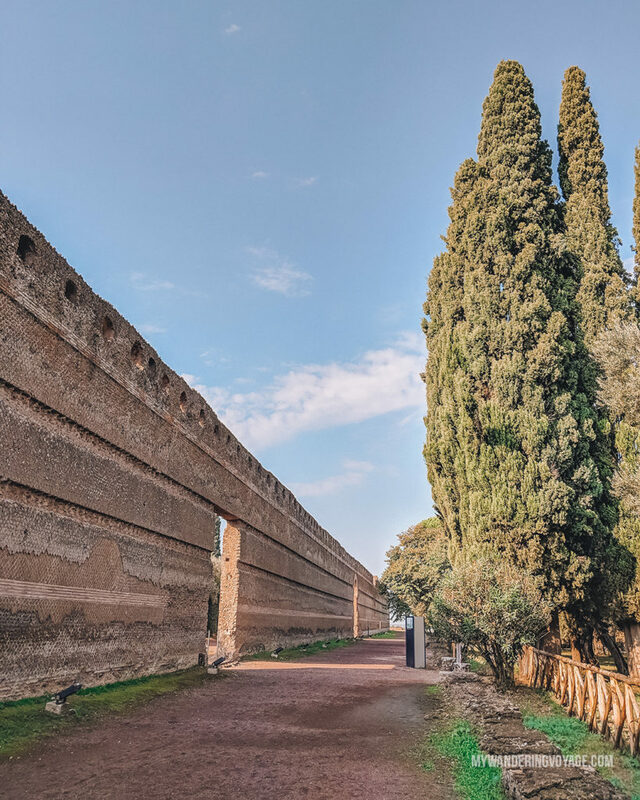 As one of the many villas built for wealthy Romans back in the day, this one was the largest, built as a summer retreat for Roman Emperor Hadrian. He was responsible for also ordering the construction of Hadrian’s Wall, located in the United Kingdom as well as Castel Sant’Angelo in Rome. 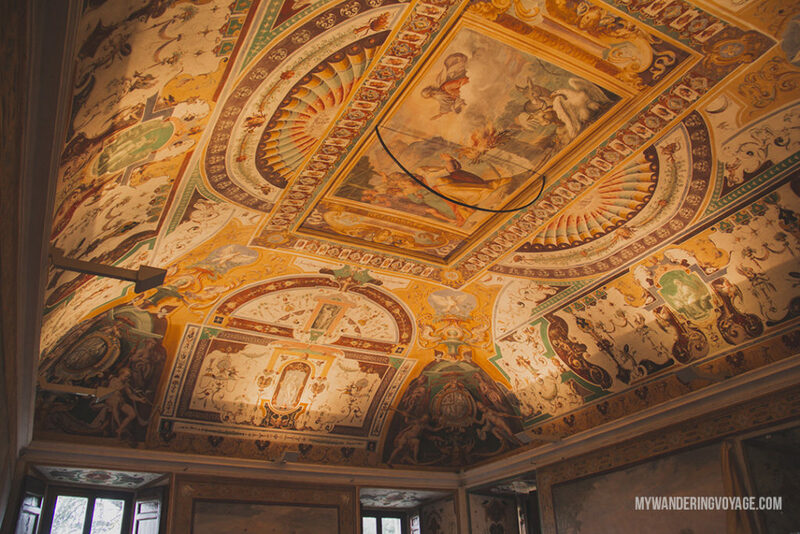 The villa is incredibly large, three times larger than the footprint of the Vatican in Rome. It has several baths, pools, temples, fountains and more than 30 buildings in total. Hadrian basically ran his empire from here for a long time, since he disliked the Palatine Hill in Rome so much. 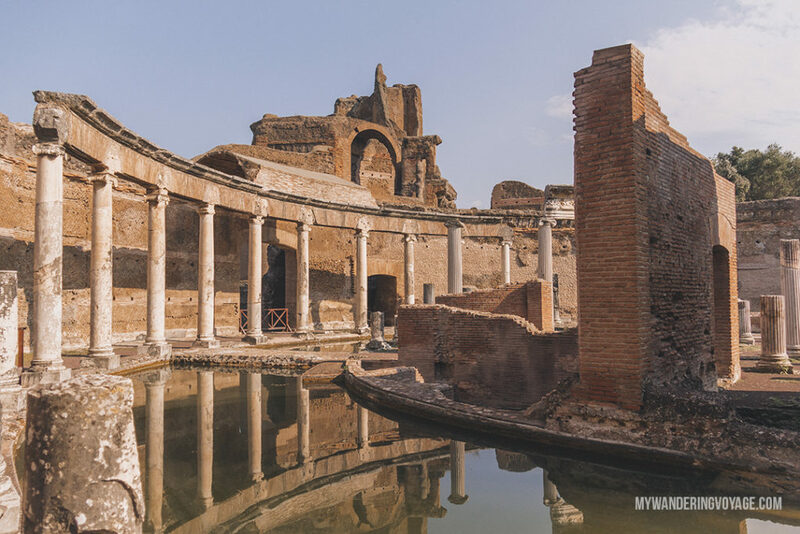 Hadrian’s Villa is a marvellous archaeological experience. 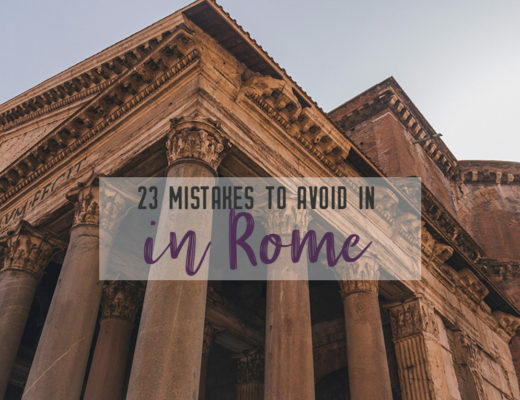 Although a few of his successors used the villa during their time, it fell into disrepair as the Roman Empire did and was later rediscovered in the 15th century. Because Hadrian was well-travelled, there is an infusion of culture and architecture from the Greeks, Egyptians and Romans. While they seem haphazardly placed among the landscape, there are four groups of buildings. The first group includes the Greek theatre and is closest to the entrance. The core group of buildings include the buildings for the Emperor and his court, such as the enchanting Maritime Theatre, Hall of the Philosophers, the libraries, the Golden Square, and the palace, which was the nucleus of the estate. The third group includes the thermal baths, including the small and grand baths and the Heliocaminus baths. It’s so cool to see the ruin of these baths and picture how the royals of the day spent their lives. 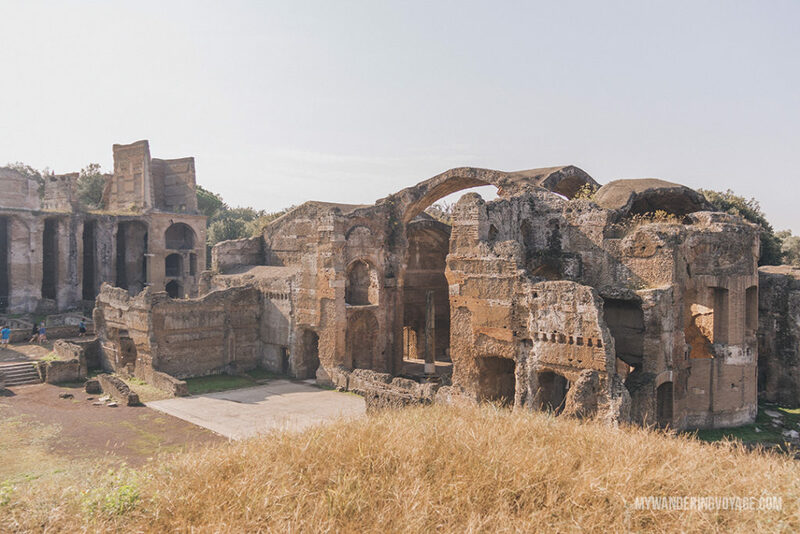 The last group makes up the Canopus, one of the most eye-catching places of the estate, as well as more underground ruins and tunnels, including those of the staff quarters, called the Hall of the Hundred Rooms. 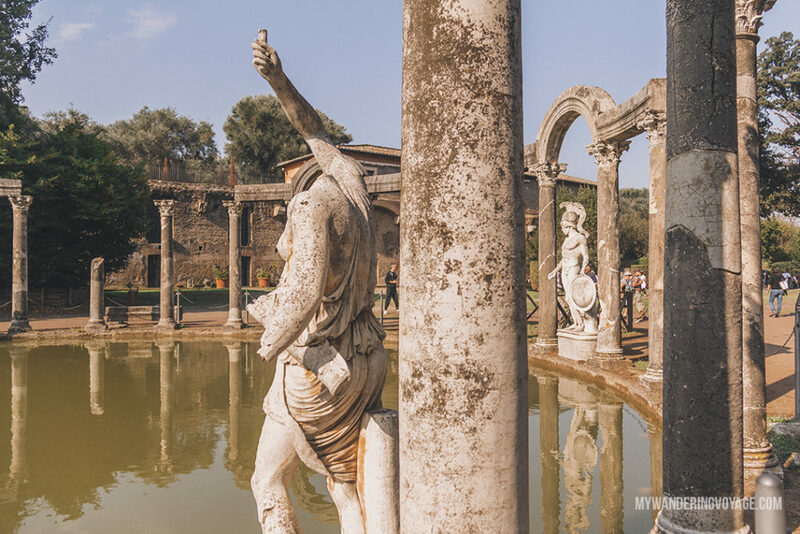 The Canopus is a long pool that was surrounded by statues and columns as well as an artificial grotto dedicated to Neptune. 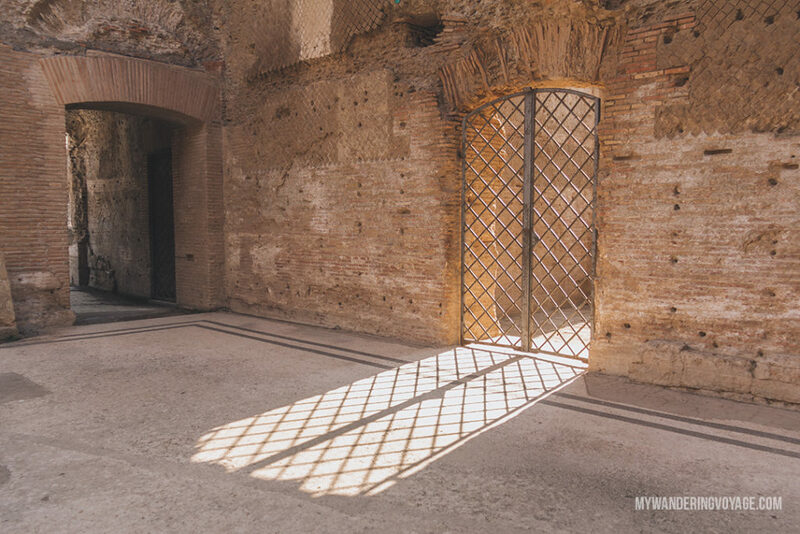 Villa Adriana is open from 8am to 5pm in the winter and 8am to 7:30pm in the summer. It costs 10 Euro to enter; however, most tours will include the entrance fee into the cost of a tour. 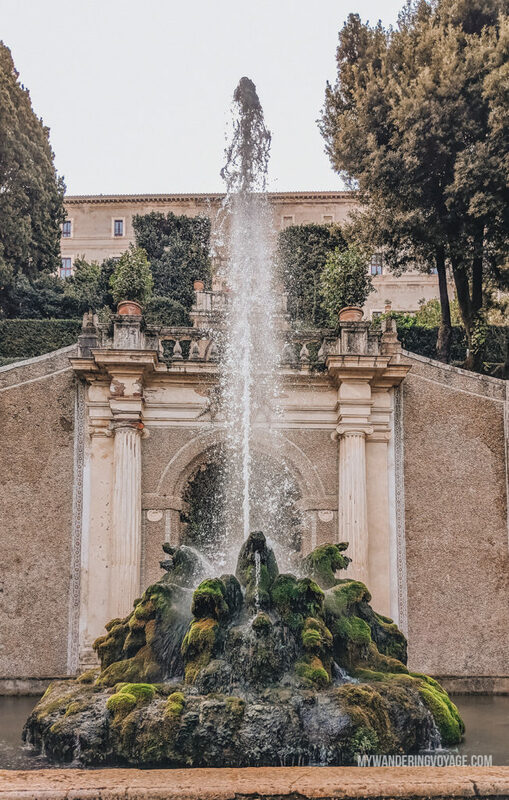 The Villa d’Este is a pure masterpiece of renaissance gardens and fountains. It is like a magical place secluded from everything. I was highly convinced that I would end up in Narnia if I took a wrong turn in the gardens. Cardinal Ippolito II d’Este owned the estate in 1550. He created this complex of fountains, grottos, water features and gardens after being snubbed for the Pope position. He was one of the wealthiest cardinals around, and he put a lot of money into this place. Tivoli, known for its ravines, caves and waterfalls was the perfect backdrop for this extensive project. You get the feeling that this place emulated the mythical Hanging Gardens of Babylon with the towering green gardens and the artificial grottos, which the Renaissance was obsessed with. What is so neat about this place is that an aqueduct and tunnel under the city feed all the fountains, similar to the engineering wisdom of the Romans. 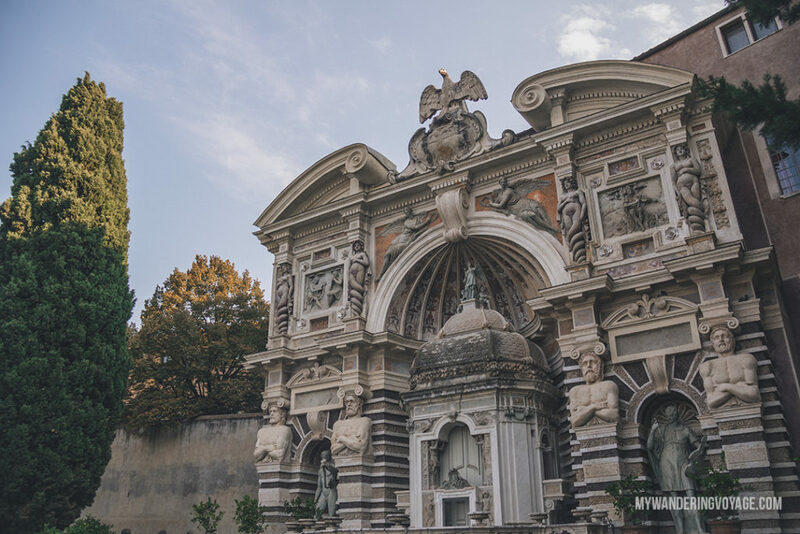 At the Ville d’Este, you’ll notice over and over again the symbol of the eagle and fleur-de-lis. The Este family has origins in France, Spain and Germany, so many of the symbols are repeated throughout the estate. 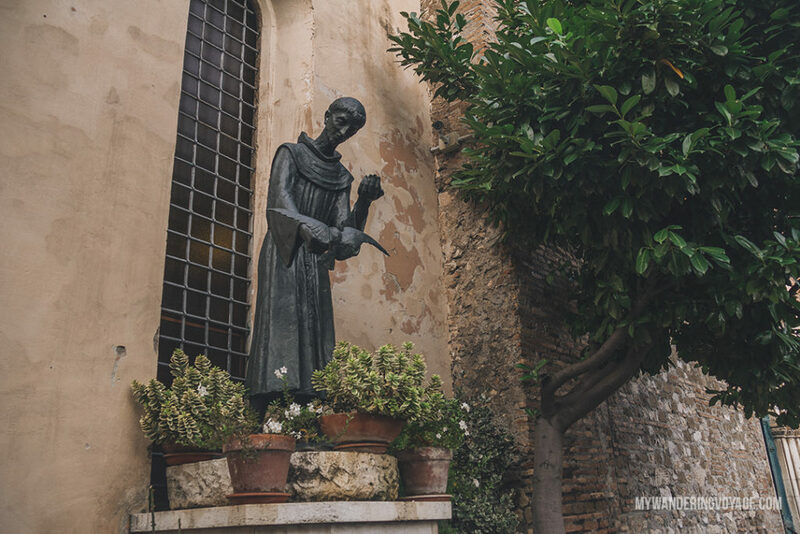 The first thing you’ll see in the villa is the courtyard, which holds the very first fountain, the Fountain of Venus, which is pretty well intact from the original construction centuries ago. 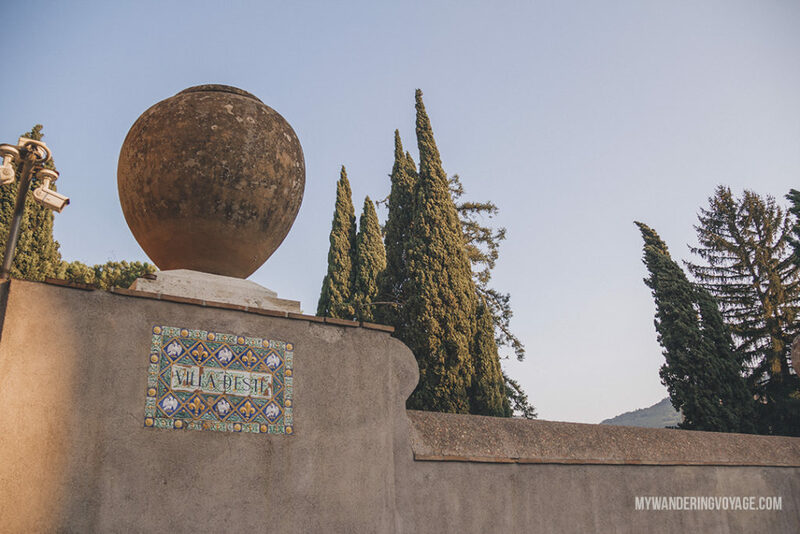 Here you’ll also see the beautiful mosaics and architecture of the time, a perfect welcome to the estate. Before heading into the gardens, you’ll want to check out the impressive apartments of the Cardinal. The multi-floor building, which was home to Ippolito, is now a museum. But many of the frescos, painting and fountains inside are still intact. Some of the “halls” were dedicated to the Roman gods, like Hercules and Venus, while others depicted Biblical scenes like Noah and Moses. In one of the rooms, there is a glass floor that shows the Roman and Medieval histories of this location. The foundations were discovered in the 1980s, indicating that this space was occupied by Romans and then by the Benedictine Covent, which was used by Ippolito and incorporated into the estate. Finally, it’s time to see the gardens, aka what Tivoli and the estate were famous for, and it’s easy to see why. 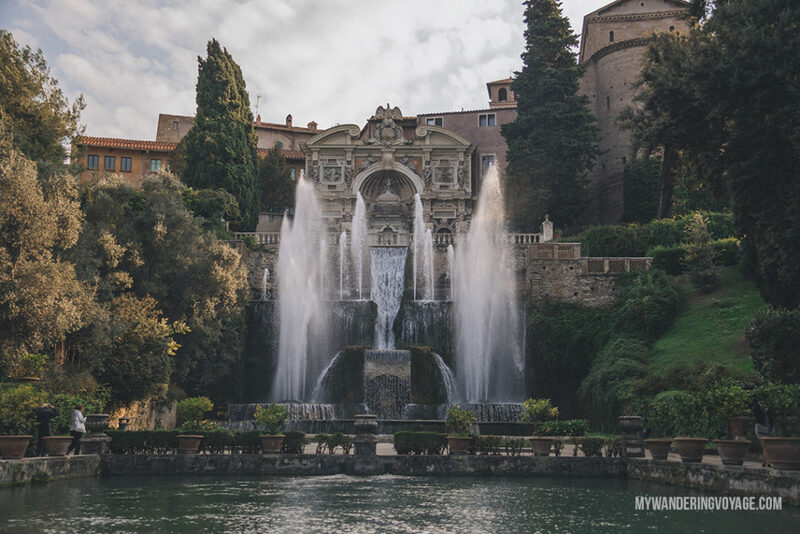 In total, the Villa d’Este includes 51 fountains, 398 spouts, and 64 waterfalls. This system is fed by hundreds of meters of canals all working entirely by the force of gravity. It’s impressive to say the very least. 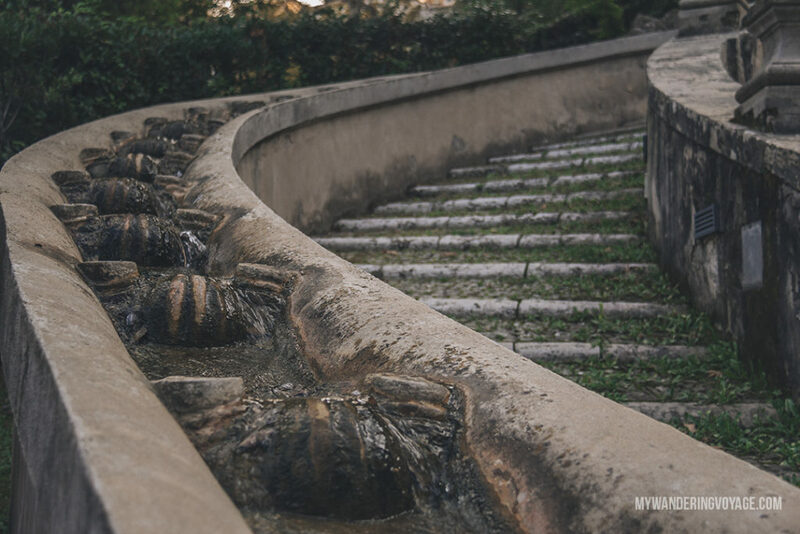 Here are some of the fountains that you don’t want to miss. The Oval Fountain is one of the first fountains you see. It’s a massive oval basin with a semi-circle wall surrounding it. In the middle sits Venus who pours water down a cascade that falls into another basin. Surrounding her are several water nymphs. One of my favourite fountains is the Hundred Fountains. At the top are lilies that spray water into a basin that feeds into masked faces that spout water into another basin. I love that it’s covered in greenery, which reminds me of what the Hanging Gardens of Babylon would be if they existed today. The Fountain of Dragons is hecking cool. It depicts the story of Hercules stealing golden apples that were protected by dragons. 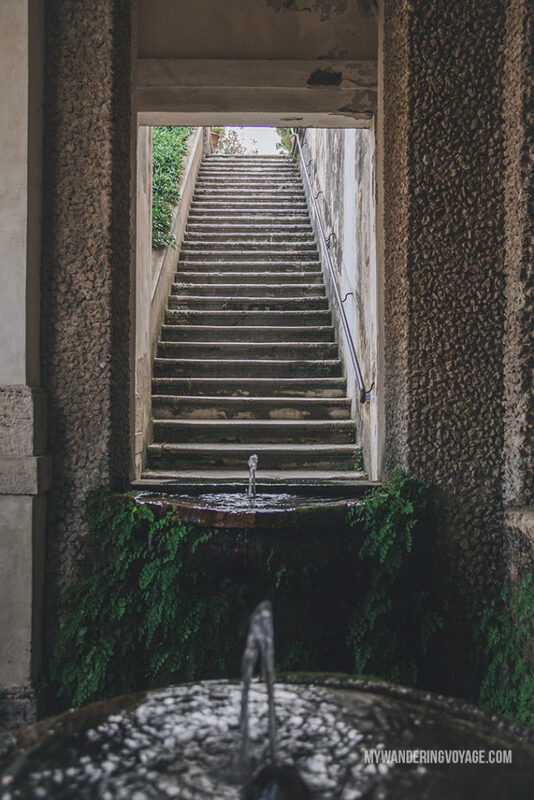 It’s surrounded by staircases, whose bannisters are actually cascading waterfalls. In the middle of the pool are the four dragons and the main water feature, a vertical water jet that shoots several feet up. 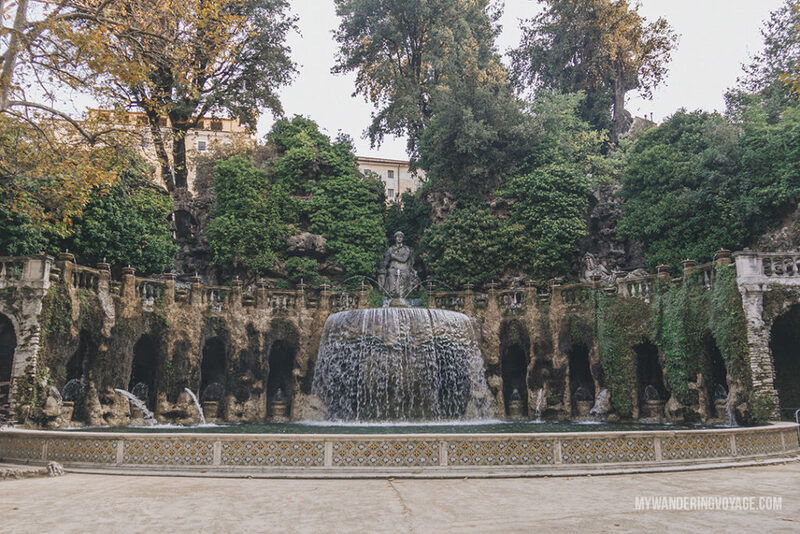 One of the main features of the Villa d’Este is the Fountain of the Organ, and it’s probably the most famous too. It was made by a French fountain engineer, who invented the mechanism of the water organ. It was the first of its kind, which is pretty mind-blowing. The organ was restored in 2003, which means the hundreds of pipes can play music for several minutes at a time. It’s an astounding feat of engineering and a magical experience. 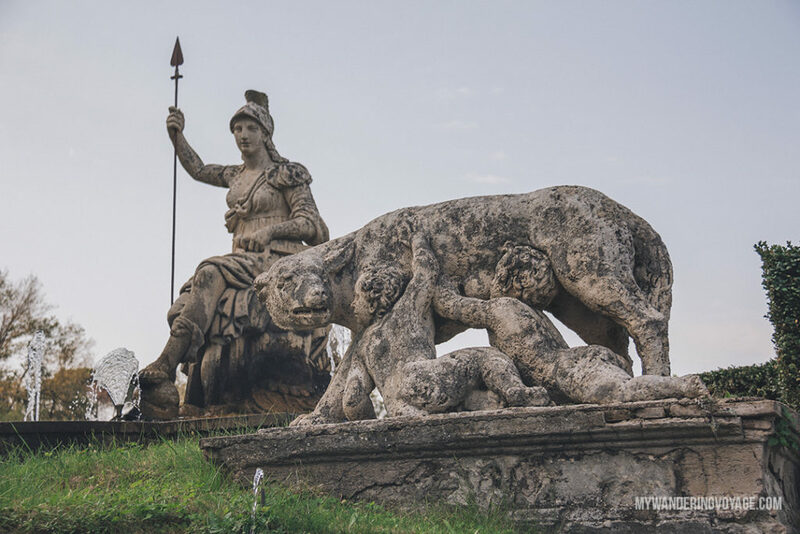 One of the most impressive structures is the Fountain of Neptune, but it’s not an original fountain. It was added later in the 1900s to replace an unfinished rocky cascade. 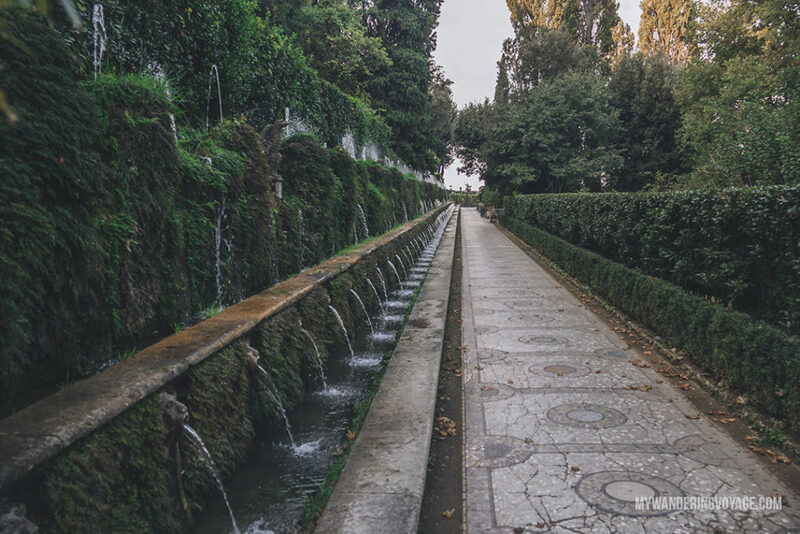 After seeing those principal fountains, you’ll want to explore the rest of the grounds, where you’ll also find the Fountain of Rometta, the Fountain of Diana of Ephesus, the Mette fountains, the Fountain of the Proserpina, the Fountain of the Owl, and so many more. 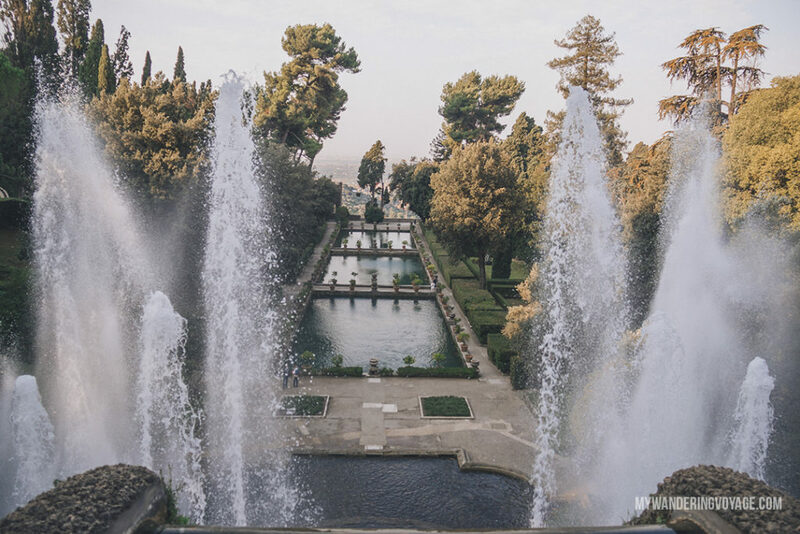 The Villa d’Este is open from 8:30am to sunset every day except Mondays, where in the afternoon it opens free to Tivoli residents. It costs 10 Euro to enter; however, most tours will include the entrance fee into the cost of a tour. There are a number of ways to get to Tivoli if you want to go without a tour. A bus leaves every 4 hours from Rome Tiburtina station and takes you right into the heart of Tivoli. It costs about $3 to $5 CAD and takes about 45 minutes to an hour. 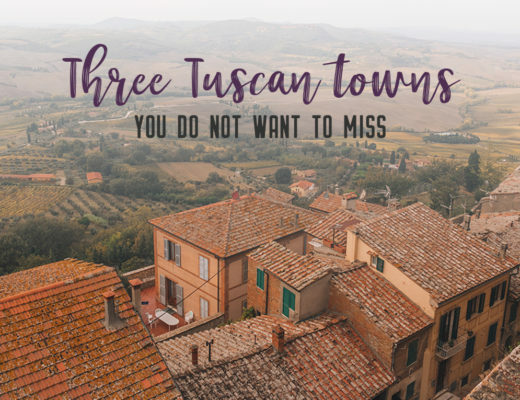 You can also take a regional train, which leaves hourly from the Rome Tiburtina station and takes you to the outskirts of the town. You’ll then have to walk or grab a taxi into town. It costs about $4 to $10 CAD. Absolutely. I took a half-day tour that left from the heart of Rome, and we travelled by bus to both locations. We had a ton of time at each location, and our guide was incredible. She was so knowledgeable about the history of Tivoli and how each building was used. She even told us some hilarious stories of the people who lived at both villas. 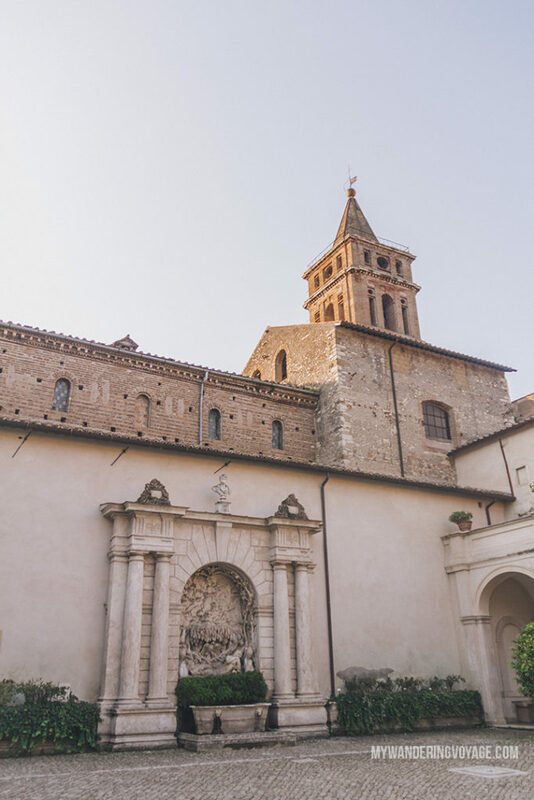 From the ruins of Roman Emperor Hadrian’s villa to the expansive estate of the Villa d’Este, a day trip to Tivoli, Italy is the perfect escape from the hustle and bustle of Rome. 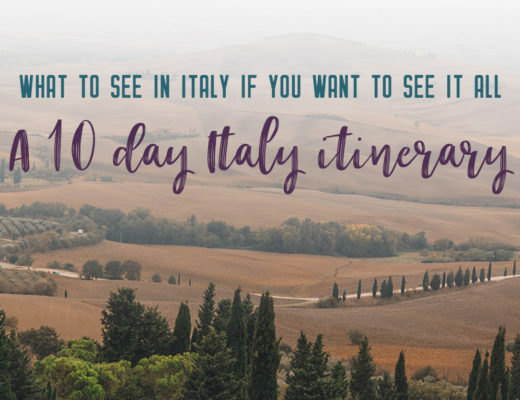 Take a trip to the countryside and travel back in time through centuries of Italian history and marvel at the picturesque setting that even the ancient Romans loved.